The Nags Head: Ready to Celebrate Christmas! Christmas is just around the corner and I’m sure you are all beavering away to get ready for the big day. This month’s issue incudes plenty of Christmas themed articles designed to get you in the mood for the festive break including our special seasonal treasure hunt. I would like to take this opportunity to thank all of our readers, contributors and advertisers who have supported us over the course of 2018. We always try to produce the best possible publication each month and report on what’s happening in the local community, but it would be impossible without your help. On behalf of all the team I would like to wish you all a very merry Christmas. See you in 2019! Copy deadline for the January issue is Wednesday 5th December 2018. Brian Smithyman, David Bailey, Eamonn Dorling, Eileen Le Voi, Fraser Dawbarns, March Podiatry, Steve Barclay MP, Mayor of Whittlesey Cllr. Julie Windle, RWT Photography, Whittlesey Osteopaths, Holly Jean, Chris Thorpe, Revd Nigel, Whittlesey Vets and AA Whittlesey Computers. Flourishing Births Nichola plans to make the classes fun and friendly to suit everyone’s needs and wants to hear from expectant mums about what they are looking for. She said: “I plan to hold weekly evening courses and weekend day courses in the new year but will also be able to hold one-to-one sessions if requested. “I would like people to contact me to let me know what they would like to get out of the classes. The classes will not just be for first-time mums but also for those who have already had children. oung March mum Nichola Neal has set up a new company to provide antenatal classes in Cambridgeshire and the surrounding areas. The 34-year-old mother of three has formed Flourishing Births to provide other young mums with the information, skills and confidence needed to manage childbirth and care for the new-born. She was inspired to set up the company following the birth of her own children, Harry (10), Libby (8) and three-year-old Teddy. She said: “I learned such a lot from my own experience of childbirth and baby care that I wanted to support other mums to help give them a good experience.” Nichola, who lives in Burnet Gardens, March, has studied hard to gain her Antenatal Educator Diploma and is now on the Register of the Federation of Antenatal Educators (FEDANT). Flourishing Births aims to provide mothers-to-be with a calm and confident birth and to inspire them to feel great about themselves whatever birth choices they may face. Situated in Whittlesey, Peterborough, we are an independent opticians with over 30 years of experience, offering a large range of spectacles and sunglasses from standard to designer. Our aim is to provide the highest level of professional ophthalmic services, using the latest techniques and equipment in a friendly, caring environment. adapted to the heat because they have been exposed to those temperatures for long periods of time. The same is true for our systems to adapt to the colder/wetter climates. The simple logic is that if you expose your system to these temperatures your body will adapt. Therefore, running our car air conditioning at 18 degrees C and then stepping out into 30 degrees C is not going to help. Neither is shying away from the heat. A better long-term strategy is to expose yourself to the heat in a controlled way. For example, run your car air conditioning at 21 degrees C, do short trips outside, and look for the shade. Strategy 4: Slow down. Naturally, adapting to a climate change is going to be challenging. Therefore, it will sap some of your energy. With this in mind, plan less in your day and take time to get a rest in the middle of the day. It is through good practice that siestas have become prominent in hot countries. Hope this helps with next year's possible heat waves or any winter escapes you may have planned! Y ou will ou r d ry❤ clea n in g sy st e m! Christmas present to someone special. Christmas present to someone special. this Christmas Your feet soworking important, Why not think?about your are hard feet but very often forgotten, so why not treat this Christmas ? Your feet are so important, them withoften a Chiropody treatment, a treat but very forgotten, so why not great way to help manage your nails them with a Chiropody treatment, a and hard corns? great wayskin to or help manage your nails and hard skin or corns? We have a range of treatments to suit everyone, why not treat someone We have asorange of treatments to suit special to a gift they will remember this everyone, so why not treat someone year? special to a gift they will remember this year? Call us on 01354 651200 for more details, our651200 Facebook page Call us or onvisit 01354 for more for special offers and information. details, or visit our Facebook page for special offers and information. on our Fragrances of the Month! Only available in Batick cream leather with oak wood stain. Picture for illustration purposes only. 1A-1B Mancetter Square, Lincoln Road, Werrington, Peterborough PE4 6BX (Sat Nav Directions - PE4 6BX house no: 1144) FREE CUSTOMER PARKING D I S C O V E R I N G Whittlesea DE CE M BE R Mon-Sat 10am to 5pm. Sun 11am to 4pm. d tribute to everything Trotter and everything Christmas! £2 F .50 ost pe ers rp int ! SIR HARRY SMITH “CONTINUES TO BE GOOD” Sir Harry Smith Community College Principal, Dawn White, has written to parents and carers to say how delighted staff were that the recent Ofsted report shows that “this school continues to be good”. The inspector found the college to be “a vibrant, welcoming and caring school, in which pupils enjoy their learning and feel valued” and where “staff ensure pupils behave very well”. This was supported by “a high proportion of parents and carers who responded to Ofsted’s online questionnaire”. Dawn White said: “I am excited and privileged to lead this college for the future and believe there are no limits to what we can achieve. On publication of this very complimentary and positive report, I should like to take this opportunity to thank our exceptional teaching and support staff, governors, parents and members of the wider community. SCHOOLS JOIN TOGETHER FOR REMEMBRANCE SERVICE Approximately 300 pupils from five local schools gathered together to mark the 100th anniversary of Armistice Day, joined by the Mayor, Deputy Mayor and councillors of Whittlesey. The event, held on November 9th, involved pupils from Park Lane Primary School, New Road Primary School, Alderman Jacobs Primary School, Coates Primary School and Sir Harry Smith Community College. During the service, Reverend Nigel Whitehouse shared the origins of the poppy with the children, including extracts from the poem 'In Flanders Fields'. Some of the children were also proud to lay wreaths or share readings on behalf of their respective schools and classes and demonstrated their passion and honour through a rousing rendition of 'Lord of All Hopefulness' followed by the National Anthem to end the service. Alderman Jacobs Pre-School are Busy Learning! Since opening in September, children starting at Alderman Jacobs Pre-School have been busy engaging in lots of exciting learning opportunities. They have explored their newly resourced classroom whilst playing alongside new friends and our experienced Early Years Practitioners. Outside of the classroom, our specialist PE  coaches have provided themed sessions where our children have become Superheroes and Pirates in order to complete a range of exciting and active challenges. Parents at our school have shared with us how pleased they are with the way in which their children have settled into school life saying, "Thank you to all the Early Years staff for making my child's journey into school so positive”. spark their imaginations and support their development. When commenting on our online communication tool parents have told us “we love to see what the children have been getting up to on Tapestry”. So far this half term the children have been on an autumn walk, explored the different textures, colours and smells of a range of vegetables and even made their own soup! Reading does succeed in Whittlesey! in community hospitals rather than centralising in big hospitals and using technology to reduce the need for journeys to hospital, is now also a government priority. I continue to work closely with local health leaders to promote it. On transport this year progress has been made in areas like the opening of the Ely bypass which helps the whole of Fenland economically. In other areas progress has moved forward but at a slower pace than I would have liked. We now have funding confirmed for construction of King’s Dyke Crossing in Whittlesey helping journeys to Peterborough, and for the next phase of the Wisbech Rail engineering study which starts this December. Whittlesey Rail station has recently undergone improvements and is now illuminated by 70 solar lights, increasing the feeling of safety amongst passengers using the footpath. Work is still ongoing on the late-night train service from Cambridge back to Fenland and on the dualling of the A47, I continue to press on these issues with key stakeholders. My recent constituency wide parish and town council roundtable brought together parishes with key decision-makers from across the county, and I am hosting similar roundtables with headteachers and arts groups in the next couple of months. This helps ensure we make the most effective case possible in securing new investment locally. Sport and healthy activity remain a key focus, so it was great news that Active Fenland secured extra money this year, and a beautiful anniversary garden paying homage to the Fens’ sugar beet industry was created by members of Whittlesey Street Pride thanks to £4000 of community funding. Above all Whittlesey and Fenland continues to show a fantastic community spirit. This was particularly the case at the moving centenary services last month to mark the end of the First World War. As we celebrate Christmas, we do so remembering those who served in the past, and with thanks to those serving our community over this festive period. All properties that come on the market with us will only pay a 1% fee! * *This offer is valid until 31st December 2018, for sole agency only. Please pop in and join us! We are sponsoring the Photobooth which will be located in our office. Come and have your photo taken and see the Singing Santa! Lorraine and staff would like to wish customers old and new, a very merry Christmas and a Happy New Year! COATES W.I. NEWS: CHRISTMAS CUSTOMS AND FOLKLORE Coates WI’s December meeting will feature Christmas customs & folklore. November’s get-together was the annual meeting, alongside an interesting and fun photo quiz arranged by Fiona – a very enjoyable evening. There’s no meeting in January, but February’s meeting begins the group’s new year with Karen Mucklin Keep Fit. Guests and new members are always welcome. The group meets the first Wednesday of the month at Coates Village Hall at 7.30pm. For more information contact Fiona on 01733 208516 or Jen on 01733 840376. LADSMITH W.I. SET FOR BUSY DECEMBER December is a busy month for members of Whittlesey Ladysmith WI, starting with a trip to the Christmas Show at Wicksteed Park. A few days later the group will support Sue Ryder when the Thorpe Hall catering team again brings its delicious afternoon tea to Whittlesey – with a seasonal theme. Next the group joins in with the Christmas Tree Festival in St Mary's Church when ‘Santa's Little Helpers’, which were made at the last meeting, will be added to its tree. This month's meeting will be Christmas party time with a Secret Santa gift exchange, special raffle, bingo and games when members will bring tasty snacks and treats to share. It will be held on Tuesday, December 11th, at 7.30pm in St. Andrew's Hall, Parkinsons Lane. More information from Sue at 01733 205927. 1st Chatteris Christmas lights switch-on at 4.30pm! 2nd 20Twenty’s Winter Wonderland 2018 is going to be packed with lots of fun and games! Come and join us at March Town Hall from 10am-2.30pm for a fun festive day - plus there is only a £1.50 entry fee for children; adults are free! Our Winter Wonderland includes craft stalls, face paint and a mini quiz for adults, plus mini shows throughout the day (times for mini shows are 11am, 12pm, 1pm and 2pm). We also have Mrs Claus’s cafe to warm yourself up with hot chocolate. Finally, we have a Christmas carnival stall where you could win some amazing prizes! Can’t wait to see you there and celebrate Christmas! 1st The Gildenburgh Choir is performing a Christmas Concert in St Mary's Church. Listen to and sing along with the choir singing Christmas songs and carols. Tickets are £6 for adults and £2 for children under 16. Tickets and Further details from Jan Sharman 01733 202782 or email Jan at jsharman76@ btinternet.com or search for Friends of St Mary's Church Whittlesey on Facebook. 7th, 8th & 9th St Mary's Church is holding its annual Christmas Tree Festival from Friday 7th until Sunday 9th. Friday & Sunday 10am-5pm and Saturday 10am-7pm. A visual spectacle of handmade ornaments and unique themed decorations on more than 40 trees. There will be carols and Christmas songs by local performers in the church from 3.30pm-7pm on Saturday. Local businesses and organisations are invited to decorate their Christmas trees with a variety of decorations with the best one judged by the visitors. Tea/coffee, cakes and mince pies will also be available. Adult entry £2.50, children under 16 free. 1st & 15th Music at the Market, outside Ramsey Library from 10am-12 pm. 8th Whittlesea Extravaganza with Christmas lights switch-on. Many attractions including fairground rides, craft stalls, refreshments, fun photobooth, prizes and a Santa's Grotto! Between 3.30pm and 7pm. Don’t miss it! 8th Christmas Party Night at The Braza Club from 7pm. Admission £21.50 per person which includes a three-course carvery! There will be a band performing live. For more details, please call 01354 652866. 8th-16th Selected rooms of Peckover House will be decorated for Christmas with festive floral arrangements. We will also be including Christmas trees brought in by community groups to reflect and continue the Peckover’s legacy and involvement in the community. Music by local choirs and musicians. Mulled wine and homemade mince pies available in the Reed Barn. House is open from 11am-4pm (last admissions at 3.30pm.) 10th Songwriters’ Evening with Steve Gibbs, at The Boat Inn, Whittlesey from 8pm. 12th Senior Members’ Christmas Dinner at the Ivy Leaf Club, with music by Steve B and Aud. Tickets are available from the Ivy Leaf Club. For more information, including times, please contact the Ivy Leaf Club. 12th Backroom Acoustic Evening at The Angel, Ramsey, with The Boatmen from 8pm. 14th Whittlesey Folk Club at The Falcon Hotel from 8pm. 15th Do you fancy a Christmas meal out with a difference? Can you wear your Christmas shirt/jumper with pride? If you answered yes, come on down to The Falcon Hotel for a night of ghostly investigations. For more information, including ticket prices and times, contact The Falcon Hotel, Whittlesea. December 2018 15th Lil Mix at March United Services Club from 8pm. Little Mix tribute band with a disco! Admission is £8 children, £10 members, £12 non-members. All children must be accompanied by an adult. 15th Rock and Roll Christmas Party at the Ivy Leaf Club, pay on the door! For more information, including times, please contact the Ivy Leaf Club. 16th Whittlesey Concert Band conducted by Kevin Mackie is performing from 7pm. This evening also features the Whittlesey Young Singers and guest soloist Shiona Cormack. Tickets £5, available from Parkers Newsagents and Don McCarthy on 07981 022040. Whittlesey Indoor Bowls Club, 194/198 Station Road. For more information, including location, please visit whittleseyconcertband. com, or email whittleseycb@gmail.com 17th Line Dancing Christmas Party at the Ivy Leaf Club, pay on the door. For more information, including times, please contact the Ivy Leaf Club. 17th Open Mic at The Halcyon (Hungry Horse), Westwood, with James Edmonds from 8.30pm. 18th Open Mic at The Boat Inn, Whittlesey, with The Boatmen and Phil Q from 8.45pm. No under 17s. 20th Open Mic night with Graham Cleaver, at The Blue Boar, Eye from 8pm. 21st Christmas Dinner and Dance at March United Services Club from 7pm. £16.50 for members, £20 for non-members. This price includes a three-course meal! While you eat, listen to the live band! 21st-22nd Children’s Christmas Party at the Ivy Leaf Club, with presents from Santa. £6.50 a ticket. Tickets are on sale from the Ivy Leaf Club until December 15th – no tickets available on the door. For more information, including times, please contact the Ivy Leaf Club. 24th Christmas Karaoke at the Ivy Leaf Club, with free entry! For more information, including times, please contact the Ivy Leaf Club. 26th Boxing Day entertainment with Ade Matthews and disco at the Ivy Leaf Club. Free entry. For more information, including times, please contact the Ivy Leaf Club. 27th Xmas Bash at The Braza Club. From 3.30pm-12.30am. Admission £8 before 6pm, £10 after 6pm. Pay on the door! Northern Soul and Motown evening. 28th Whisky Bar Acoustic Sessions with The Boatmen at The Boat Inn, from 8.30pm. 29th Skool Disco, ’80s style at the Ivy Leaf Club. Tickets are £5. For more information, including times, please contact the Ivy Leaf Club. 31st Rock and Roll NYE Party at the Ivy Leaf Club. Tickets are available from the club. For more information, including times, please contact the Ivy Leaf Club. 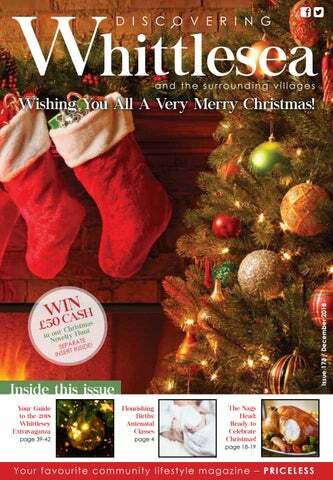 See our Facebook page Discovering Whittlesea Magazine for more events and offers. Regular Local Events MONDAYS Quiz Night at the Nag’s Head, Eastrea, 8.30pm. £1 to play and max. five per team. Cash and raffle prizes to be won! TUESDAYS Love to sing? Join Singchronicity, an all-ladies chorus for their weekly meeting at Orton Wistow Community Centre, Orton Wistow, Peterborough, PE2 6XN, every Tuesday 7.30pm-10pm. Contact Tina Overton on 07434 582838 or Deana Foot on 07732 123359, for more information. WEDNESDAYS Bingo at Palmer Close, 6.30pm. Call Julie on 03701 924126 for more details. March Can't Sing Choir. Every Wednesday evening at Trinity Hall, March. From 6.30pm-8.30pm. Entrance fee is only £3.50 on the door. All abilities welcome. For more information, please contact Val on 07952 639495. Play Scrabble at Palmer Close on the second Wednesday of each month, 1.45pm. THURSDAYS Tai Chi sessions held at Eastrea Village Hall, 7.30pm-9pm. Beginners most welcome. Part of the Eastern Counties Tai Chi Academy. Contact Jan on 07842 090506 or just turn up. All adults welcome. FRIDAYS Gentle keep-fit class at Coates Public Hall. 10-11am. £3.50 per session. All welcome. Contact Karen Mucklin for more info on 07516 461438. SATURDAYS Join walkers, runners and volunteers at the free Whittlesey Parkrun each Saturday starting at 9am at the Manor Fields, Whittlesey. For more info visit www.parkrun.org.uk/ manorfieldwhittlesey, email: manorfieldwhittleseyoffice@ parkrun.com or find us on Facebook. SUNDAYS First Sunday of the month: Jim’s Bingo at the Conservative Club. Doors open at 7pm, eyes down at 7.30pm. be on show at in February's issue of the magazine. Message from the Mayor... On Saturday 8th December I have the great pleasure of opening the Whittlesey Christmas Extravaganza. This event is organised by Lynn Palmer and her Extravaganza organising committee, who work tirelessly throughout the year to ensure that this fantastic event happens for the benefit and entertainment of the town’s residents and visitors. I know that the organising committee carry out sterling work to raise funds and attract event sponsors to make this such an enjoyable and special family event for everyone at Christmas time. A big thank you to the organising committee and all the event sponsors. £1.50 ENTRY PER CHILD Located at the rear of Hubs. Sponsored by Round Table and Ladies Circle. JOHN DEERE RIDE-ON PEDAL TRACTOR Raffle tickets can be purchased from Ben Burgess, Eldernell Lane, Coates PE7 2DD or on the night of the Extravaganza. Sponsored by Savage Builders and Benn Lock & Safe All sponsors will be on show at the event and will also be featured in February's issue of the magazine. FREE PHOTOBOOTH COUPON TO BE USED AT THE PHOTOBOOTH LOCATED AT AND SPONS0RED BY MALCOLM JAMES ESTATE AGENTS. COUNCILLOR SURGERIES WILL BE HELD IN GROSVENOR HOUSE FROM 9.30AM TO 10.30AM ON THE FIRST SATURDAY OF EVERY MONTH THROUGHOUT 2018. 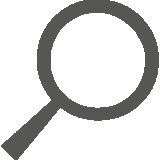 Councillors present on Saturday December 1st will be: Councillor Alex Miscandlon (District and Town Councillor) Councillor Rita Jolley (Town Councillor) If you have any matters of concern and wish to discuss them with a Councillor, then please come along and let us know. Stay Merry, not Miserable in the Run-Up to Christmas ‘TIS the season to be jolly – but as we prepare for the season of goodwill, not everyone shares the Christmas spirit. With many of us starting the Christmas shopping earlier, there is a fair chance that many of our shop purchases and online orders are beginning to pile up. So, with gifts galore adding to the decorations, tree, food and drink, December is a time when many of us let our guard down, amongst the excitement leading up to the big day. For opportunist thieves, visible presents under the tree, open car boots full of shopping while loads are being taken into the house, and even the possibility of an unlocked garage are rich pickings which can turn your Christmas from being ‘Merry’ into ‘Miserable’! Equally, flaws in home security while out and about visiting friends and family are a beacon to thieves – so always remember to check your alarm and never leave doors, windows or garages unlocked. Some tips for a safe and happy festive season: • Don’t leave presents in full view – either in the home or on the back seat of the car. • Shorter days mean a longer time for thieves to be in operation – always lock your car and front door when entering your home. • Keep a light on indoors and outdoors if you are out visiting friends or family. • It may be an idea to fit some motion detector security lighting – it won’t just be carol singers who come calling. • If using outdoor festive lighting, ensure cables aren’t passed through windows, leaving enough of a gap for burglars to make use of. 	Plastering and decorating 	Complete conversions 	Wall removals 	All internal work 	Kitchens supplied from top manufacturers Call Martin Hardy on 01733 841237 or 07754 070606 mthservices7@yahoo.com All CRB/DBS checked. Public liability insured. We have a team of registered local numbers, electricians and plastered. We are fully insured & registered waste carriers. Members of Safe Local Trades. • Keep your personal data safe – and securely dispose of receipts. This is partly because of Power Purchase Agreements (PPAs) where a power generator sells the energy it produces directly to a buyer. PPAs are long-established in the US and are becoming more common in Europe. By finding installations with sufficient power requirements it is possible to sell all the power generated by a renewable energy project to the private sector at pre-agreed prices, giving more certainty to investors. For years, the UK Government offered a range of subsidies for clean energy projects, providing grants for those setting up commercial renewable energy plants and offering reductions on energy bills for homeowners who installed solar panels on their houses. This helped to create many small plants supplying energy to the National Grid and also helped the Government to reach its legally binding obligation to cut carbon emissions. This all changed when the Government scrapped subsidy payments for onshore wind projects. With the withdrawal of subsidies, investment in the wind sector dropped. The private sector won’t commit to projects that don’t produce suitable returns, instead looking to alternatives for higher returns on investment. Similarly, in other renewable sectors, such as solar, as subsidies decreased investment in the sector was pared back. However recent figures suggest that this is changing. The main reason, however, is the return on investment that the private investor can now yield. This has partly come about due to the reduction in the cost of generating power from wind and solar sources. The technology is becoming more efficient by recovering more energy when in operation and thus driving the cost down. The cost of the turbines and solar photovoltaics used in renewable projects has also come down, so the sector has gained the benefits of both reduced capital outlay and increased generation. Battery technology often goes hand in hand with renewables. Wind and solar plants frequently use vast arrays of batteries to store generated energy. Despite huge advances in battery technology in recent years, the cost of these limits the potential for returns. This sector is developing very quickly, so although it remains a ‘watch this space’ opportunity for now it is a very exciting prospect for the near future. Having worked with a number of developers and landowners on renewable energy projects, it is an exciting prospect that technological development is now providing opportunities for people to set up profitable renewable energy sites without relying on subsidies. That Ha ndyma n You know them small jobs that builders are not interested in doing because they don’t make a mint or those niggly little jobs that never get done because you may not have either the skills, tools or time. • Lawns cut • Small tree surgery • Landscaping • Fencing- repaired replaced or installed • Panelling, feather board and palisade • Gates repaired, replaced or installed • Decking Installed and maintained • Patios laid, cleaned and re-sanded • Sheds repaired and roofs re-felted • Rubbish, get that messy garden cleared of rubbish • Water Butts Installed • Gutters cleared. • Leaking taps and pipes...sorted • Washing machines, dish washers and taps installed • Sinks, toilets and bathrooms fitted • Waste pipes unblocked. It’s as easy as 1, 2, 3. 1. Make a list of those little jobs you need sorting. • Replacement of light fittings, switches and power sockets to existing position. • Laminate and wood flooring fitted • Painting and decorating • Dry walling • Tiling of walls and floors & tiles replaced • Unfinished DIY projects you just have not got the time to do. Why not let me have a look at it? • Flat pack furniture. Do you find it frustrating? Always got bits left over? Cant find that Allen key! Let me assemble and install where required • Pictures and mirrors hung • Blinds,curtain rails and poles fitted • Lofts/attics insulated and boarded & loft ladders installed. inappropriate taxation issues that can easily be avoided by engaging a professional adviser. These issues should be considered alongside the ever-present impact of inflation when conducting an annual review of your finances, if you need help working through this contact an Independent Financial Adviser and ask about Cash Flow Modelling. Government legislation can change, and observations are made with information available at the time of writing. ■ Issued by Wealthline Limited, which is authorised and regulated by the Financial Conduct Authority. Past performance is not a reliable indicator of future results and any forecast is not a reliable indicator of future performance. The information contained in this editorial should not be construed as offering investment or tax advice. LIONS HELP LOCAL GROUPS Whittlesey and District Lions Club has donated £500 to two local charities. It has presented the money to Whittlesey Community First Responders and New Queen Street Surgery Patient Participation Group. Thanking the Lions, Laura Philpott, of Whittlesey Community First Responders, said “CFRs are a group of people who are trained by and volunteer their time for the East of England Ambulance Service. We respond to 999 calls such as diabetic emergencies, breathing difficulties and cardiac arrests. Our aim is to reach a potential life-threatening emergency in those vital first minutes before the ambulance. We help to stabilise the patient and provide appropriate care until the ambulance arrives to take over. Whittlesey Christian Church was the host for a very successful fashion show in aid of the Mayor of Whittlesey's Charities. A packed audience including other local Mayors and guests witnessed a top show of fashion provided by Penco Dress Agency, of Whittlesey, and Sophy Beth’s Hair and Beauty. The Mayor of Whittlesey Cllr Julie Windle was delighted with the evening which raised more than £1000 which in time will be shared between the Whittlesey Young Persons Counselling Service and The Alzheimer’s Society. The Mayor thanked the church and Pino Soccio and his Young Technicians for their support. “Our kit bags cost around £2000 each. All the money we receive is through fund-raising and donations from groups such as yourselves. We don't receive any grants, so your donation will make a huge difference to us and to those we help.” Lions President, Steve Palmer, said: “It is a great pleasure to donate this money for new equipment to help a local cause such as Whittlesey Community First Responders. They do a magnificent job and you never know when any of us may need their services urgently.” The £500 donation to New Queen Street Surgery Patient Participation Group will be used towards the purchase of a Dopplex Ankle-brachial machine which checks the blood pressure in the patient’s arms and legs to detect blocked arteries caused by peripheral artery disease. Here are some tips to keep your loved ones safe and happy over the Christmas period. When putting up decorations and a tree, watch out for any trailing wires, lights and effects hanging off your tree. The lights may burn your pet; they may get tangled in the wires; receive a shock if they chew them; or the decorations can cause problems if chewed or eaten. If you have a real tree be especially careful with the pine needles; these can get stuck in their paws, eyes or ears and can be dangerous if eaten. It is best to keep your pet away from the tree and to vacuum frequently. Try to place your tree where they cannot get to it directly. Seasonal plants such as holly, mistletoe, ivy, poinsettias, amaryllis, lillies and potpourri should be kept out of their reach as they are poisonous. Lit candles can also be a big hazard. Make sure you do not overfeed your pets, especially with rich foods and things they have not had before. Also keep an eye on those visitors and ask them not to feed your pet. Avoid mince pies, Christmas cake, Christmas pudding, raisins, grapes, chocolate, stuffing, onions, garlic, macadamia nuts as they are toxic to our pets. Also dispose of any string used during cooking the turkey. Do not feed them anything with cooked bones in, as this can lead to intestinal obstructions and a trip to the vet. Wrapping paper and accessories can also prove dangerous, so make sure it all gets thrown straight into the bin. Any presents you don't wish your pet to help themselves to, should be kept out of their reach. Have you bought your pet a present yet? Make sure whatever you treat them to is safe for them. If you are having a house full of guests plan ahead, make sure your dog has had plenty of exercise beforehand and once they have said hello to everyone have a place set up where they can go and retreat for some peace and quiet. If your pet is used to visitors you will still need to keep an eye on their behaviour, making sure they do not get too stressed or excited and remember never leave your dog alone with children. Keep all medications, (yours, your pets' or your visitors') out of reach from your pets. It is important to protect your pet from the cold. Their bed should be away from draughts and in a warm quiet area. With some breeds of dogs or elderly ones, they may need a coat when out for a walk. Whilst walking keep them away from cold or frozen water. You may want to think about boots for your dog as their feet need to be protected from the salt used to melt ice. Animals are attracted to the sweet smell of antifreeze, which is as dangerous to them as it is to us. Be aware that the liquid in snow globes may contain antifreeze; make sure your pet does not lick or swallow the liquid. We wish you a great, fun packed, incident-free Christmas and a prosperous New Year! PRICE FREEZE FOR GARDEN WASTE SERVICE The subscription fee for Fenland District Council’s garden waste collection service has been frozen for another year after a successful second year of the service. With more than 20,500 subscriptions this year, the service has continued to be self-funding – with the council making enough savings to be able to freeze the price again for 2019/20. The £40 annual subscription fee, which was first introduced in 2017/18, will stay the same for the third year running, ensuring it remains amongst the lowest priced authority garden waste services in the East. All new and existing customers paying for the fortnightly service by annual direct debit will also benefit from a continued discounted direct debit cost of £36. Existing annual direct debit customers will have their subscriptions automatically renewed in February at £36, ready for the garden waste service to start in April 2019. For more information on the garden waste service and to sign up, visit www.fenland.gov.uk/ gardenwaste or visit one of Fenland’s four @ Your Service shops and community hubs. The Blessings of God For some, Christmas can be a terrible time of loneliness and sorrow, a far cry from the original reason we celebrate Christmas. Due to a variety of practical reasons, it is difficult to pinpoint exactly the day the birth of Jesus Christ took place. But in the real scheme of things, does it matter? What we do know for certain is that it did happen, there was a baby child called Jesus born in a stable, who King Herod sought to kill. He did perform the miracles spoken about in the Bible, and astounded many with his words of wisdom, life and hope. There may be many things we do not understand about God, but the historical records all show Jesus Christ to be someone who was equally at home in the presence of the Roman Empire’s elite as he was with the downtrodden and poor. Studying the life of Jesus Christ shows him to be someone whose overriding passion was, and still is, to bless humanity. I recall speaking to a friend who didn’t believe in God about the very things I’ve just mentioned, and he was obviously struggling with understanding them. He finally asked – ‘what do you mean by the blessings of God?’ – Thinking about how I could answer him in a way he could easily understand, I remembered the explanation given by a young child as they attempted to describe their first journey in an elevator “I got into this little room, closed the door, pressed a button and the upstairs suddenly came down”. Sunday December 16th at 10.45am Come, relax and enjoy as each department in our church, the children, youth, puppeteers, dancers, drama, song and poetry, become imaginative in bringing a little bit of heaven down to earth through their presentations. Aren’t we often guilty of overcomplicating life or losing its sense of thrill and wonder, like our first elevator ride? Oxney Road, Peterborough, PE1 5YN Terms and Conditions apply. Official fuel consumption figures in mpg (l/100km) for the New Ford Focus ST-Line 5 door 1.0L petrol Ford EcoBoost 125PS: urban 45.6 (6.2), extra urban 62.8 (4.5), combined 55.4 (5.1). Official CO2 emissions 115g/ km. The mpg figures quoted, sourced from official EU-regulated test results (EU Directive and regulation 692/2008), are DPlease I S contact C O your V local E RT.C.Harrison I N G D E CEM Bcomparability ER 2018 purposes and may not reflect your actual driving experience. provided for dealership for details. Images are for illustration purposes only.